When the lower esophageal sphincter doesn't function properly, acid and food can reflux up from the stomach into the esophagus. This can lead to pain (heartburn) and damage to the lower esophagus. This damage can cause strictures (narrowing) of the esophagus, and eventually, cancer of the esophagus. 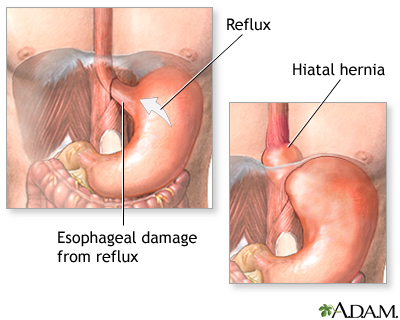 Frequently, dysfunction of the lower esophageal sphincter is associated with a hiatal hernia, in which the lower esophagus and upper part of the stomach slips up into the chest.